It’s that December mix of holiday time — wrapping up business for the year, and mixing in some seasonal pleasure, celebration, gift-giving, and travel, with it all. We’ll have a similar mix here on the blog heading into the new year, looking at the “fiscal aspects” of some of our seasonal traditions, as well as charting early business indicators for the year ahead. Right now, we’re heading toward the end of Chanukkah — it’s the 6th day/night of the 8-day holiday, as we post this. One of the traditions for the week is to give “Gelt” to children — a Yiddish word for “money.” The tradition started in 17th century Poland, when kids would be given coins to give to their teachers, for end-of-year appreciation. 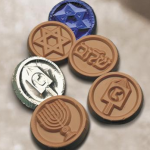 The tradition soon expanded to giving coins directly to the kids for year-end gifts, and ever since an American confectioner invented them in the 1920’s, foil-wrapped Chocolate “Gelt” has become a staple of dreidel games (the spinning top used for some light Hanukkah “gambling!”) everywhere. In any case, we no longer pay in gold nuggets (or even gold coins! ), and gift cards and prepaid cards are often the “gelt” of choice when slipped into a seasonal card or envelope. Your customers will want to be giving them, so make sure your business is ready to offer prepaid cards, and to process them! AVPS can help you on both counts, freeing you up to not only focus on your business — but on all the holiday pleasure you’ve worked so hard all year to earn! So get ahold of your AVPS rep today — and sit back and enjoy those latkes tonight!